Simbla Review: Build Websites, Develop Apps. But Is It Too Good To Be True? Want to build websites and apps but don’t have any experience? Read our review of Simbla to see if it’s right for you. Simbla delivers one unified business environment where novices can easily make both websites and apps — via drag-and-drop tools. This has an appeal also for designers and resellers. The Simbla site suilder isn’t the most popular solution on the market, but it certainly has design aspects that make it appealing. The templates look clean and elegant, with support for all types of media. This situation also bodes well for small business owners, since you can avoid spending money on a developer and make the website (and a complementary app) yourself. 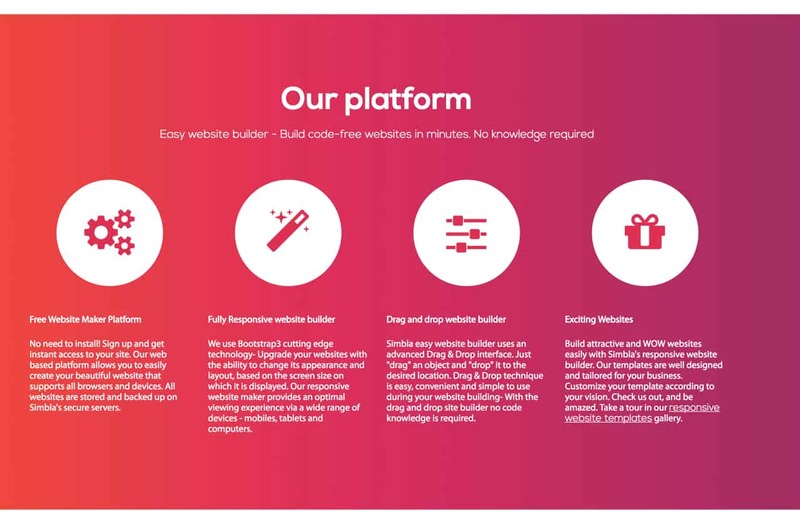 What Does the Simbla Site Builder Offer? Should You Consider Simbla as Your Site Builder? To put it simply: a lot. In fact, the Simbla website builder has a full app market and a library for selecting pre-built design templates. So, no worries about starting from scratch. You can find a template that’s designed for your industry, plug in some of the apps that help expand functionality, then generate a mobile app that looks like the website but provides even more tools like coupons and reward programs. Simbla is unique in that it allows even novices to easily build both website and apps. All of the website templates are responsive, so they look fine on mobile devices. When building, you have access to a drag-and-drop configuration. Some developers find this useful for speeding up the design process, but it’s also great for beginners who are trying to get a professional result without spending too much money. The templates are modern, with flat designs, one page options, and beautiful widescreen formats for grabbing attention and displaying large imagery. The majority of the templates have stock photos that relate to certain industries, but you can remove these and put in your own. You’ll find everything from email subscription forms to team member highlights. These are all in the form of modules that are described in full and waiting there for you to move around on the template, delete, or insert. The designs have a similar look to that of Squarespace, so if you’re after a minimalist look with plenty of whitespace, this might be a good choice. It’s more for setting up a blog, small ecommerce store, or company website than anything too complex. A Simbla pre-built design template. This one allows for online booking. What’s interesting is that all of the websites you build are completely free and based on Simbla’s servers. You work through the web-based interface, so you won’t have to find any hosting or search the internet for a solid content management system to download. It’s all wrapped up into one nice package. The websites are made with Bootstrap 3, a popular and tested framework for creating responsive sites. Considering Simbla has both app and website building tools on the platform, you can create your own database-driven website or app. For example, if you needed to collect lots of information from your customers and manage this in a secure and efficient fashion, you can manage that within Simbla, not an external tool. A smaller business website would work fine with this setup, but most companies couldn’t imagine not having the option for a blog or product catalog. That’s why most who opt for the free plan would likely upgrade to a paid option. An e-commerce store if you opt for one of the higher priced plans. The Simbla builder doesn’t offer a free trial. That makes sense since you can go with the free plan and see most of the features for yourself. We’ve skimmed the surface of Simbla’s features, but now it’s time to explore the tools a little more. For example, what’s located in the app store? What does the drag-and-drop builder really feel like for the user? Simbla’s design templates are built on the popular and tested Bootstrap framework. Bootstrap is one of the top performers for creation of responsive websites. The Simbla app market isn’t remotely close to anything you might think of from Apple or Android. In fact, it currently only has around nine apps, some of which aren’t available yet. Blog: for creating, editing, and publishing new articles and guides for your business. This supports photos and other types of media. The majority of regular editing features are there for you, but it’s not going to have more advanced tools like you would find in WordPress. Overall, it’s a solid blogging system that connects directly to your website with ease. News: this app runs as a news ticker to place at the top of your page. For example, you might want to let recent visitors know that you’re having a promotion. If that’s the case, the News button has buttons and links for people to click through and take advantage of products and promotions. This is part of the drag-and-drop system from Simbla, so you can technically place the news ticker anywhere on your website or homepage. Product Catalog: here’s an app that shows off your products in a dynamic catalog, similar to a portfolio. You could most likely use this for a creative design or fashion portfolio or for showing off any services you might be selling. Several relevant fields come along with the Simbla product category, so it almost makes the gallery look like an e-commerce store, without the “buy” buttons. Lead Manager: collect your leads with your Simbla website, then use this app to manage and track them. For example, you can collect email addresses and other customer information through a field on your Simbla site. Status and progress reports can be adjusted as needed, and the sources of your leads are logged for figuring out where your most effective marketing efforts should be placed. The Lead Manager app also has a chat box for internal notes. This way, someone else in your company won’t repeat herself when interacting with previous leads. E-commerce (Coming Soon): as of right now, the e-commerce app is coming soon. We assume it’ll work somewhat like the Product Catalog, but with a payment processor, shopping cart, and Buy Now buttons. Knowledge Base (Coming Soon): here’s another app that hasn’t been released yet, so we can only predict what’s to come. Considering most people know what a knowledgebase is, we expect it to have a search field and links to articles for customer support. Site Analytics (Coming Soon): stats come in handy when trying to gain actionable insight from your customers’ onsite behavior. You might see that some of them are entering your site via social media links, or maybe your Google Ads are working out. Regardless, the Analytics are sure to deliver an incredible amount of information about your users and products. Email Marketing (Coming Soon): if this app has the right features and campaign tools, it’s going to be one of the best parts of Simbla. Very few website builders have acceptable email marketing services. Some of the best are MailChimp, AWeber, and Campaign Monitor. The only problem is none of them integrate well with website builders. You still have to develop your own email marketing campaigns through the dashboard, so an email marketing app from Simbla would cut down on management time. You also might find some impressive integrations with the e-commerce store and blog. Online Scheduling (Coming Soon): as the final app in the Simbla app store, the Online Scheduling tool promises some sort of calendar. I’d assume it would allow doctors and other professionals to display their schedules and allow for booking of appointments. The Simbla founders created the company in 2013, so it’s a relatively new company in the website building world. Both founders had around 15 years of experience developing websites, and they wanted to find a way to expedite the process and turn both app and website development into a more cohesive experience. The founders state that websites are supposed to be for everyone, and that’s exactly what Simbla does. It’s always nice when the mission statement matches the output. The free plan from Simbla doesn’t make it special at all. It’s merely a fancy free trial, since the website you create is pretty much left with no features after the first 60 days. However, a notable feature involves that of the drag-and-drop builder. The templates from Simbla are clean, modern, and elegant, making for a sleek design process and a professional-looking website. Furthermore, the website links up directly to some basic apps so that you don’t have to be a computer whiz to get your site launched online. Simbla makes creating a website or an app as easy as snapping Lego pieces together. It’s becoming increasingly clear that Simbla stands out most for beginners. The templates rock, but you don’t have to mess around with them much to make your brand look good. This bold Simbla template is geared towards services. Another area that looks good for the Simbla team involves the online database and web application builder. The average person doesn’t know how to make a mobile app that’s worth anything to their business. Some mobile app builders look decent, but many of them simply duplicate whatever you have on your website. There’s no point in doing that because mobile apps need to demonstrate some sort of additional value, like with a mobile rewards program or scanning tool. In fact, this is the most advanced part of Simbla, and the area that might interest some developers out there. It’s a code-free app building experience, and you have the ability to connect with a database. The online database builder is one of the cleanest out there. In fact, some might think it’s more of a consumer product. It’s a cloud-based platform with the same drag-and-drop user interface builder. Overall, the strongest aspects involve the permissions, roles, and users. So, for one app you’ll be able to keep people out of the app unless they enroll as a user. The database logs all of their information and keeps it secure and organized. There’s no need to know any database programming languages, since the entire infrastructure is already built for you. The Simbla blog covers updates and interesting articles for building your website. It’s not unique, but the company does talk about several Simbla-related features that you might not be familiar with. The actual support is handled through a ticketing system. Simbla doesn’t have any live chat support or phone lines, so you’re stuck with email. That’s not exactly a bad thing, but you must realize that you’re not going to speak with a person on the phone before signing up for a website builder. Some companies wouldn’t dare choose a website builder if phone support wasn’t offered. Others might not care as much. Along with the ticket system, you get a full knowledgebase, with a field for searching keywords and some primary FAQs to scroll through. They even have a nice guide for creating a website in five steps — yet another indication that Simbla is directing its focus toward beginners. You can’t go wrong with Simbla if you’re a novice. Even some more advanced users might find it useful if you utilize Simbla to make and sell quick websites to small businesses. After that, you can develop apps that pair with your Simbla website and even consider taking advantage of the database tools. However, some of the apps and other features aren’t released yet. So, you’re currently stuck with whatever they have in the app store, which isn’t much. In the end, you’ll need to weigh the benefits and drawbacks here based on your specific needs. Simbla Site Builder isn’t exactly groundbreaking in what it offers, but it’s a worthwhile consideration for those who require a decent-looking website quickly. You are here: Home > Website Builders: All The Top Builder Brands Ruthlessly Reviewed > Simbla Review: Responsive Websites. But How is Their Customer Support? Previous: DoodleKit Review: No Fancy CMS But Here’s Why It Still Works. Next: Impress.ly Review: Is This Mobile-First Site Builder Right For You?